Vicky was watching from his hotel with wonder the large casino with its glittering lights, lighted fountains, the moving marquee and the jostling crowd in and out and he felt he was in a dream land. He had come to Connecticut on some project work from the Bay Area. He had another fortnight to stay here. 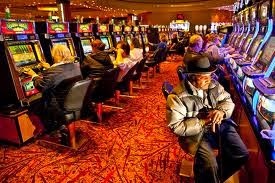 He was tired watching the TV and walked briskly towards the casino. He was in a mood to try his luck with a maximum outlay of hundred dollars. One good thing about him was that once he decided an upper limit, he was never tempted to exceed even if Lady Luck were to smile on him. He got 100 dollars changed into coins from the counter and bought a large bottle of coke. He went around the casino looking at the varieties of slot machines, roulette, blackjack and other games of chance, He chose a quiet corner and decided to stick with one machine this time. On earlier occasions he used to hop from one machine to another impatient if it did not win for him. There was none around as he started trying his luck. He chose one dollar machine instead of quarter machine. He kept inserting the coins and pulling the handle to rotate the reels. There were a few wins but were soon eroded by losses. He had exhausted about 80 dollars and wished to stop for a while to get a break. He leaned on the chair and closed his eyes keeping his mind blank. There was a whiff of perfume, shuffle of shoes and he could hear someone sitting in the adjacent chair opposite another similar machine. When he heard the ring of coins falling in the receptacle, he opened his eyes to see a drop-dead beauty. She was young, not tall, a blond with a long skirt. She said hi with a smile and he smiled back. "Thank you. That was not much. I am Melinda. Let me play before the winning streak vanishes" she said with a giggle. He watched her putting one dollar after another for a few times losing all the time till she finally sighed and said with a guffaw “I am broke. Let me watch you make money. Come on play. I will cheer you"
"Thanks. I am Vicky. Let me try with you as my mascot. May be I will rake in lot of money" he said and started playing. He stopped when he lost ten dollars and said “I am short of luck today despite your presence by my side. I had decided to devote 100 dollars and I have only 10 with me. With that also gone, I would move out"
"Vicky, luck seems to evade you with the machines conspiring against you. I have a deal for you. Do you care to listen?" "Come on Melinda. I am game. Tell me what"
“Let me play those ten dollars for you. If I win, you will have half of winnings. I think I will win. What do you say?" "Agreed. What if you lose?" "Haha.Good question. I have nothing to give except me if you wish” she laughed with a wink. Taken aback at her audacity, he said "Hmm, play, let us see our luck"
The young thing started playing. The first dollar itself raked in 25 dollars. Then she started losing all till she was left with two dollars. The penultimate fetched her 100 dollars and in her glee she hugged him showering him with smooches. Vicky was all smiles. With bated breath she inserted the last dollar she had and Lo the cash register did not stop ringing and playing music. She had hit a jackpot of 5000 dollars. "Are you happy?” Melinda asked holding his hands. "Hurray, have no fear. Let this spot of luck for us blossom into long term friendship. Are you single? I am." she said. “I am.I was just kidding about your losing part. Let us be friends. Hurry up, we will celebrate with a great dinner and what not” he said as they walked out of casino hand in hand. Here is a win win situation. Nice and Pleasant story. Clever guy - I mean the 'let's (just) be friends' part. Nice story, though I was thinking what twist would be..:)..but then it's also nice to have a nice ending...btw thanks for your comments on the challenges, will see how I can have measurable means to select the best..